India will soon benefit from world-class helicopter ambulance services provided by Bengaluru based Aviators Air Rescue with a fleet of three Airbus H130 helicopters. The Indian Directorate General of Civil Aviation (DGCA) recently notified stringent guidelines for offering Helicopter Emergency Medical Services (HEMS) in India, allowing single-engine helicopters for daytime operations. Aviators is set to become the first dedicated HEMS provider in India. This pioneering service is the result of a tripartite agreement between Aviators Air Rescue, Air Medical Group Holdings Inc., a leading air medical provider in the United States and Airbus Helicopters. All three H130 will be put to use for medical missions only and will come equipped with specialised equipment for emergency transportation of patients, organs, neo-natal and other time critical medical missions. Helicopter deliveries are scheduled to commence in the second half of 2016. Aviators plans to launch the service from October 2016.AMGH and Aviators have options to acquire additional helicopters for use in this venture. The service rollout – including the training of pilots and medical personnel along with the definition of practices and procedures – will be supported by Airbus Helicopters and Air Medical Group Holdings Inc. The service will be offered to state governments, rescue groups, hospitals, clinics, public and private companies, and also to individuals through subscription. “It is an honour that Aviators and world-renowned Air Medical Group Holdings have put their faith in our helicopter to rescue Indian lives threatened by emergency medical situations. 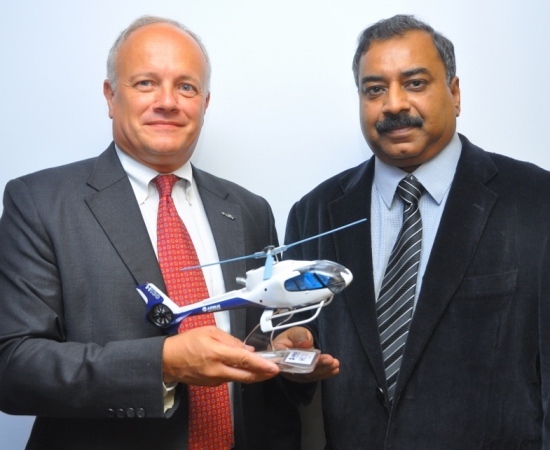 We will bring to bear our global expertise in medical helicopters and our India-based support and services team to ensure that these H130s are always ready to respond to a call,” said Xavier Hay, President of Airbus Helicopters in India. The H130 is a global reference among single engine helicopters for air ambulance missions. In addition to the pilot and the co-pilot or a technical crew, both of whom can be seated in the cockpit unlike any other helicopter of its class, the H130 can accommodate a stretcher and seat three more attendants or para-medical staff in the cabin. The low internal sound and vibration level and the flat cabin floor offer a suitable environment to install both sensitive and bulky medical equipment. Airbus Helicopters’ signature Fenestron® shrouded tail rotor design allows the H130 to land in congested areas with protection against impact collision and also makes it safer for medical personnel working in the vicinity of the rotor. The H130 comes from the proven Ecureuil family of Airbus helicopters. More than 5,500 Ecureuil helicopters have been delivered till date, clocking more than 23 million hours of flight time in various missions including HEMS, passenger transport, law enforcement, etc. Additional information on Aviators is available at www.airrescue.in. Air Medical Group Holdings Inc., headquartered in Dallas, Texas, is a leading provider of air ambulance programs throughout the United States. A proven solution to our partners, Air Medical Group Holdings Inc., offers an array of customized air and ground medical program designs. The company’s extensive fleet rapidly delivers teams of highly trained professionals to patients, striving to provide the patient with the best possible outcome.